One day, Judah went to visit his friend, an Adullamite called Hirah. While Judah was there, he saw a Canaanite woman called Shua and he married her. Shua became pregnant and gave birth to a son called Er. Then Shua became pregnant with a second son and she gave birth to him. She called him Onan. 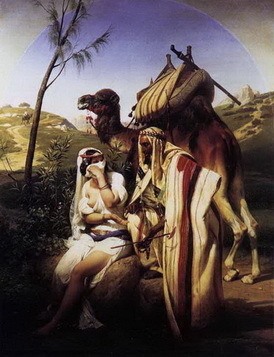 Shua became pregnant a third time and gave birth to his third son called Shelah. Judah got his oldest son, Er, a wife called Tamar. Er was a very wicked man and so the Lord killed him. Onan knew that if he has a son through Er’s wife, Tamar, the son will not be his heir. Therefore, while Onan was with Tamar, he purposely spilled his sperm on the ground so that Er will never have an heir. The Lord is not happy with what Onan did, so he killed Onan also. Judah said this because he was afraid that Shelah will die just like his brothers. While Shelah was growing up, Judah’s wife, Shua died. Judah felt comforted and went up to visit his friend, Hirah the Adullamite. Someone told Tamar that Judah had traveled to Timnah to shear his sheep. So Tamar took off his widow’s clothes, covered herself with a veil and wrapped herself and sat down at a public place. Judah said, “Yes.” So Judah gave her the signet and cord and his staff and he went in to lay with her. And so Tamar became pregnant. Tamar put away her prostitute clothes and put on her widow clothes. When Judah sent the young goat to Tamar, he couldn’t find her in any places in the town. After three months, Judah heard that Tamar is pregnant and he wanted to punish Tamar by burning her to death. Judah acknowledged that the staff, signet and cord belong to him. It came to the time when Tamar had to give birth. Tamar gave birth to twins. The first one came out and then drew back into the womb because the second one breakthrough. So they called the second son Perez because he broke through his brother. Then out came the firstborn whom Tamar called Zerah.